Holocaust survivor and human rights activist Inge Auerbacher spent three years as a child imprisoned in a Nazi concentration camp in Czechoslovakia, where out of 15,000 children, barely 1 percent survived. Following her emigration to the United States in 1946, she received a BS in chemistry from Queens College. Since then, she has worked for over 38 years as a chemist with many renowned medical scientists and researchers. Auerbacher is also an accomplished writer. She also wrote the lyrics to the song "We Shall Never Forget." This was the only original song presented at the 1981 Jerusalem "World Gathering of Jewish Holocaust Survivors." Auerbacher is the author of 6 books which have been published in 9 languages: I Am A Star : Child of the Holocaust, Beyond the Yellow Star To America, Running Against the Wind, Finding Dr. Schatz: The Discovery of Streptomycin And a Life it Saved, Highway To New York, and Children of Terror. 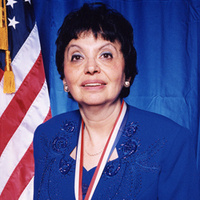 She was awarded the Ellis Island Medal of Honor, the Louis E. Yavner Citizen Award, and an honorary Doctorate of Humane Letters from Long Island University. An accomplished chemist and author, motivational speaker Inge Auerbacher continues to inspire audiences of all ages with her strength and spirit. In 2013, she was awarded the following prestigious awards for her work teaching tolerance and reconciliation: the Medal of Merit from the state of Baden-Wuerttemberg, the Medal of Merit from the city of Goeppingen, and the Federal Cross of Merit given by the President of Germany.